Yet another likely delay in dispatching the much-awaited aircraft carrier has caused tempers to flare back in India, but the problems aren’t as grim as reported. It is a setback no doubt, but the “technical malfunction” experienced during INS Vikramaditya’s high-speed trials in the Barents Sea is hardly a disaster. Some sections of the media have reacted as if the innards of the aircraft carrier have been blown to kingdom come and the ship is crippled. But what happened was that seven of the eight steam boilers in the carrier’s power plant overheated, forcing the Russian-Indian crew to call off the trials. Indians collectively threw their hands up in exasperation. You can’t blame them. INS Vikramaditya is the country’s most prestigious acquisition – the public has been waiting a long time for this majestic ship to sail into home waters. They have been let down repeatedly since 2005, the year Russia started refurbishing the old carrier, formerly known as Admiral Gorshkov. However, casual observers have missed the point that the overheating was discovered during trials. That’s what trials are for – to identify and remove such glitches. And no, unlike what some ‘experts’ have been suggesting, fixing the problem won’t require cutting open the ship. Do they really think each time there is engine trouble the navy has to cut open its ships? Despite two boiler blowouts during its Red Navy days, Vikramaditya’s problems aren’t insurmountable. Because the ship’s propulsion system is brand new, the problem is most likely with the integration of the boilers. The sea trials have been under way for several months off the north coast of the Barents Sea, and in all other respects the ship appears to be in working order. Two months ago the carrier experienced its first landing, by a MiG-29K. In fact, some of the Indian crew has been working on the Vikramaditya for over a year, and currently most of the other 1,250 crew are present. Information trickling in from them suggests the first reports exaggerated the problem, and that the ship is sailing on its own power. The overheating seems to be happening at high speeds. These losses are of truly frightening proportions but they are also a pointer to the reality of naval aviation – a moving airfield is unlike anything else in the world of weapons. India and Russia have barely scratched the surface of carrier construction. The hiccups with the Vikramaditya are, therefore, part of a steep learning curving. An inevitable reaction to the boiler blowout will be the demand that Russia return the money and keep its boat. That would be highly unwise because India is down to half a carrier currently and new aircraft carriers are not available off the shelf. This is another unique problem with these massive ships – no country makes carriers to market, so basically India cannot order one for love or money. Those describing the Vikramaditya as an expensive freebie forget that India’s first two aircraft carriers, INS Vikrant and INS Viraat, were also ‘gifts’ from Britain. In the 1980s, the Indian Navy inducted 30 British Sea Harriers for Viraat. More than half were lost to crashes, and the jets were grounded in August 2009 after a Harrier crashed in Goa, killing the pilot. Viraat, described as a “toothless tiger” has spent most of its life in dock, and only the ingenuity of Indian engineers has prolonged its life. So right now India is sailing up the Indian Ocean without a paddle. The navy’s 40,000-ton carrier being built at Cochin Shipyard will not be ready before 2017. It is, therefore, urgent that India stay the course on Vikramaditya. A year’s delay won’t hurt when we have waited seven. The Indian Navy needs at least three aircraft carriers to ensure that two always remain active – one each for the eastern and western seaboards – when the third is undergoing repairs. Meanwhile, China, which has acquired aircraft carriers from Russia and Ukraine, has publicised its plan to develop three task forces, to patrol the areas of Japan and Korea, the western Pacific, and the Malacca Strait and Indian Ocean region. The carrier is not a one-off thing between India and Russia. In April 2012, a stealth frigate, the INS Teg, was commissioned in Russia. It will be followed by two more such stealth ships, to be inducted early next year. The 125 meter frigate displaces 4,000 tons and includes the BrahMos surface-to-surface missile system. The Navy says the ship is “well suited to undertake a broad spectrum of maritime missions”. The lease of the nuclear powered submarine Nerpa and Russia’s not-so-secret help with the development of India’s own nuclear submarine, Arihant, are pointers to the deep ties between the countries. Again, these are not off-the-shelf technologies and Russia is not sharing them with any other country. However, the incident in the Barents Sea couldn't have come at a worse time for bilateral ties. Russia has lost a string of military deals, notably for MRCA and helicopters. From the public’s point of view the latest soap opera needs to end soon. 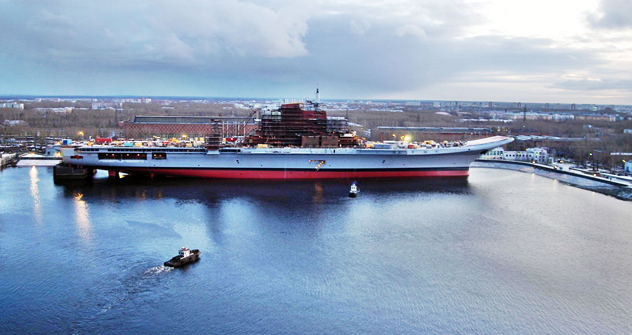 Sevmash Shipyard in North Russia, where Vikramaditya is being refitted, needs to get its act together. There are reports in the Russian press about mismanagement and lack of accountability at the company. Sevmash could also read the riot act to the official who blamed India for the malfunction, for refusing to allow the use of harmful asbestos to insulate the engine. Better PR skills are needed in people working on such a strategic project. India’s defence procurement system is also plagued by delays. For more than 30 years, India’s bureaucrats have failed to okay a long-range artillery gun for the army, leaving the generals nearly apoplectic. There are also inexplicable delays in implementing the contract for the Scorpene attack submarine at a time when the number of India’s diesel subs is down to single digits. And the 11-year Medium Range Combat Aircraft saga isn’t over yet, with the contract yet to be signed with France. In fact, it’ll take another three years after the signing of the contract before the first Rafales arrive in India. Basically, every wing of the military is tangled in red tape. In this backdrop, blaming the Russians alone would be puerile. Over the next five years, India will splurge more than US$ 100 billion to modernise its military. A good chunk of this will go to the navy, which after keeping a low profile for the past several decades is poised to break out to the deep blue sea. INS Vikramaditya will clearly be at the spearhead of that thrust, but there will be plenty of other areas where Russia’s military expertise will be required.